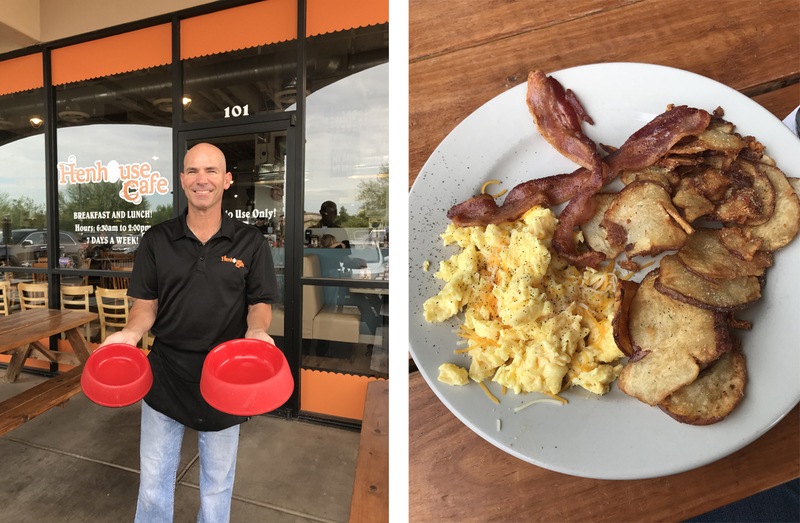 We will be blogging on different dog-friendly restaurants in the Mesa, Gilbert, and Chandler area over the next few months, until we have tried most of them. We post our schedule on our website under Calendar of Events if you want to see where we’ve been and where we’re going next. 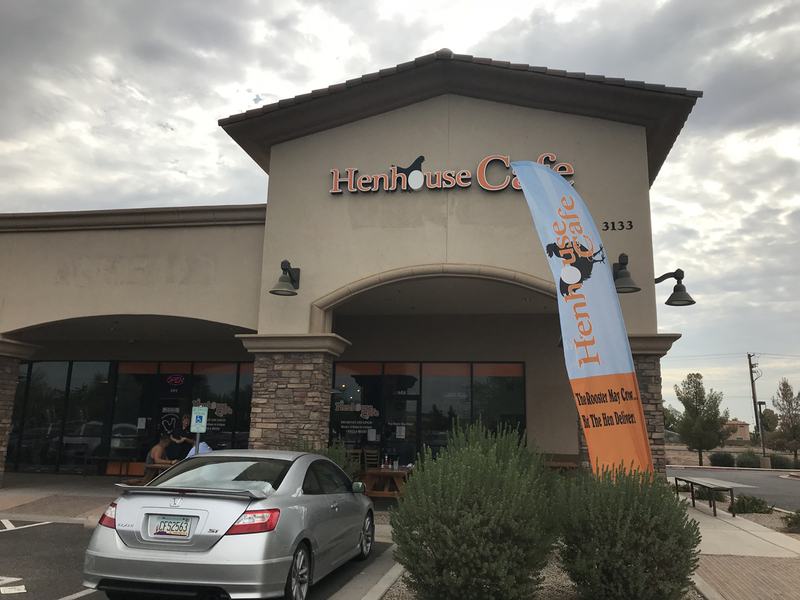 There are a few locations of the Henhouse Café in the Phoenix East Valley area. In fact, I drove past the Gilbert location on Higley at Guadalupe 8.6 miles further to go to the other Gilbert location at Lindsay and Pecos. I chose the Lindsay location over the Higley location because I viewed each one virtually using Google Earth app to see what type of patio environment I could expect before I was actually there in person. I highly recommend checking out Google Earth app using both street facing view and aerial views so you can virtually visit. Using Google Earth app, you can make sure a facility has outside areas and what you need it to offer before actually arriving there in person. 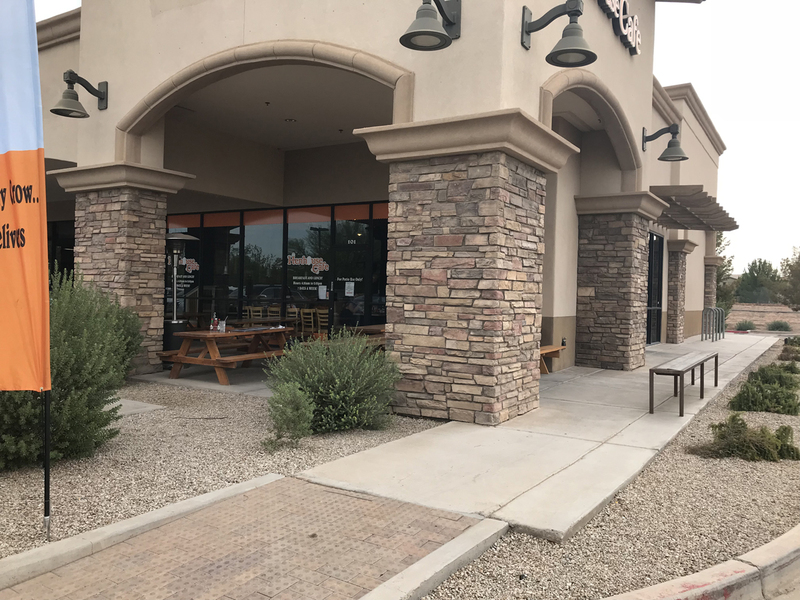 And in the case of these two Henhouse Café restaurants in Gilbert, I preferred the larger covered patio with the picnic table seating which is what is offered at the Lindsay location. I was willing to drive further for that environment because I knew it would be better for my Old English Sheepdog puppy, Wrigley. The staff was super energized the morning I was there. They were in really happy spirits and their happiness was contagious, and their pleasantness just made my whole day. It was a Thursday morning. I ended up leaving Wrigley at home because that morning he had some digging adventures and had muddy paws. Having thick fur, he takes a while to dry off after rinsing. But I still sat outside at the picnic tables and asked the staff what-if’s scenarios when people bring their dogs. This restaurant is full-service meaning the wait-staff will come serve you outside. 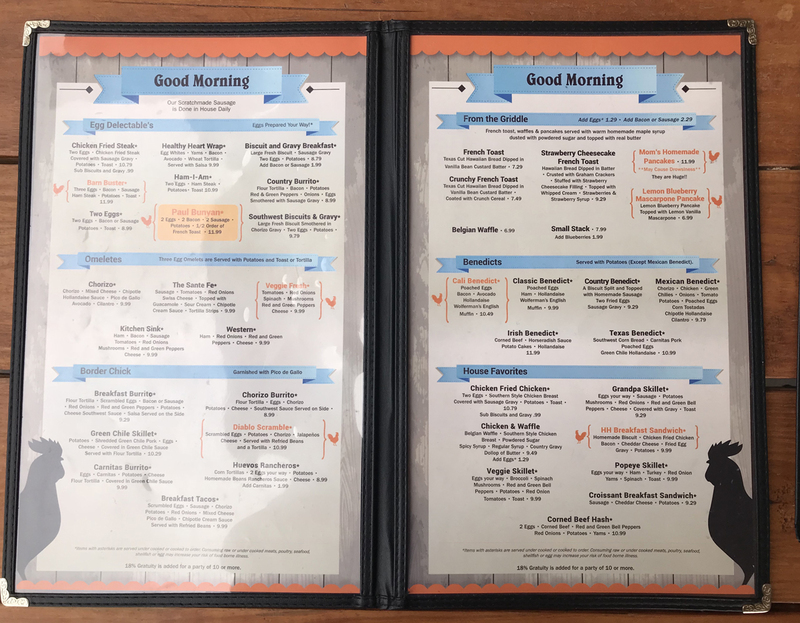 They will bring out their menu, take your order, bring your food, check in often to see how you’re doing, and take your payment, all outside while you and your dog are at the picnic tables. While this may seem silly to point out, this full-service seems to be less common and is not available at all restaurants. And if you are traveling with just you and your dog, full-service is preferred because you can’t take your dog inside with you to order at the counter. Debbie the hostess told me dogs come to the patio all the time. She said just the day before, there were four dogs at one time on the patio. That makes me smile. I wish I would have been there. Keith showed me the dog water bowls they have available for big and small dogs. He said some people will order food for their dogs and their dog’s food gets served in a to-go box. Because of strict health codes they do not share people dishes with dogs. (That’s nice!) But he still wanted everyone to know dogs can be served food in a container. That way is better than using a napkin or nothing at all. The menu has many choices that would be suitable options to feed your dog. Eggs and chicken are probably the best choices, but there are also potatoes and yams. You can find a tasty snack for your pup and that would be a special treat. I had the Two Eggs (with cheese, bacon, and the country fried potatoes). It was good home-cooking, southern-style comfort food. I love that this restaurant has made their patio a smoke-free environment. As a dog mom, and now taking my dog with me to eat out more often than before, I can only sit in the patio areas with my dog. I am so pleased to be able to enjoy my meal in a smoke-free environment, for both me and my dog. My dogs are not service dogs. They will not be going inside restaurants. My dogs love the fresh breezes and outside smells, so outside is preferred for us. Near the patio is plenty of landscaping which makes perfect sniffing opportunities for dogs. Some of the picnic tables are right next to these bare ground landscaped areas, which might be a good spot for your dog to lay down during your meal. 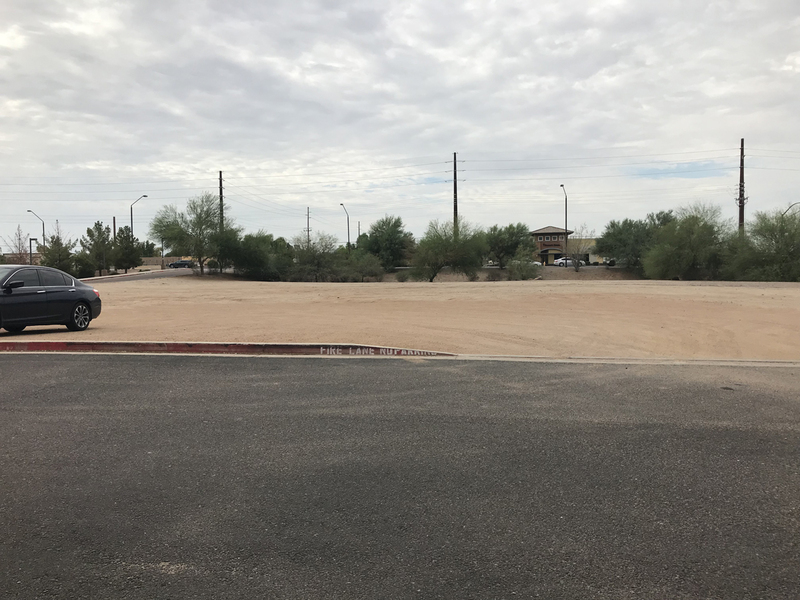 Across the parking lot is a huge vacant dirt lot that would make for a nice place to give your dog a potty break. As with all our pet-dining experiences, we comment on the human bathrooms because you might need to use one. There are only indoor bathrooms at The Henhouse Café. Since I did not have my dog with me, I did check out their indoor bathroom. 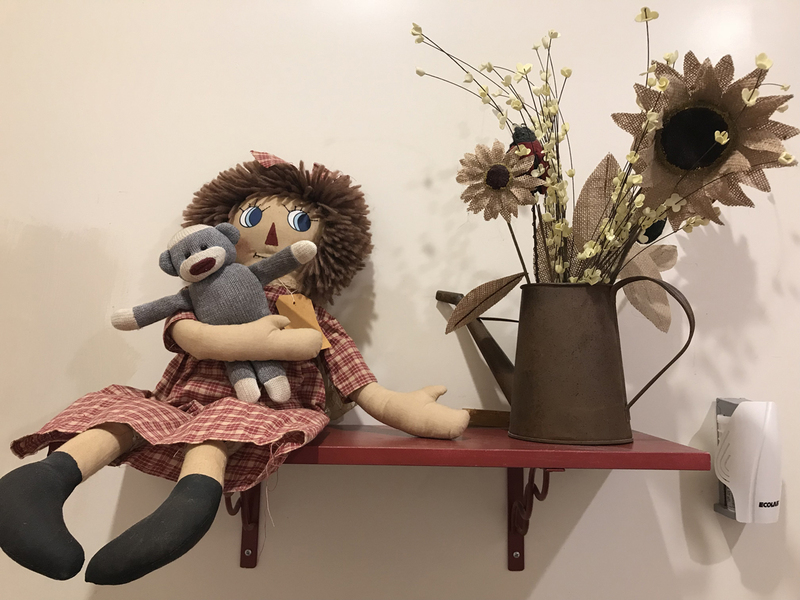 When was the last time you saw a homemade country Raggedy-Ann Doll holding a tiny Sock Monkey? So adorable!!! Even their bathroom has a country feel. 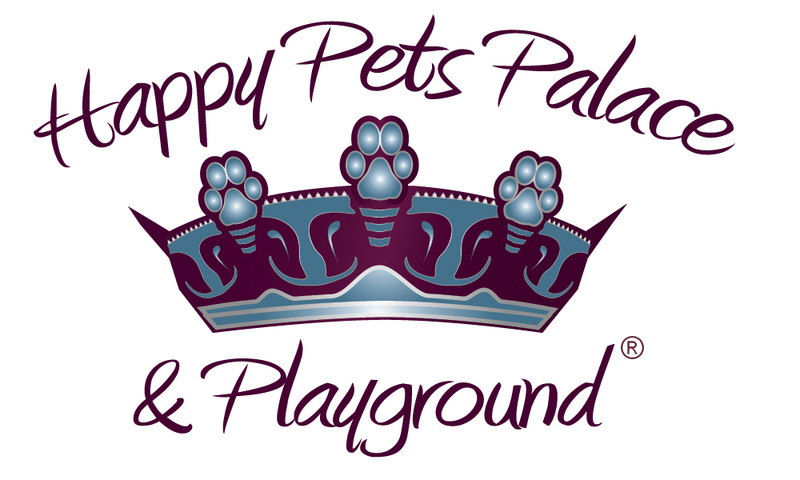 But if your dog is with you and he can’t come inside, then know this restaurant is located in a growing area of town and there are several gas stations with public restrooms nearby. You’re welcome to join us at our future dog-friendly restaurant experiences, with or without your dog. We will take pictures and blog about the experience afterwards. Check out our future dates on our Calendar of Events.